Start your journey with a special in-store experience with your loved one at Charles Edward Jewellers Perth. Learn how to create a bespoke engagement ring with an unparalleled combination of creative design, stand-out-style, the finest materials and quality craftsmanship. How Does the Custom Jewellery Design Process Work? Our designs are tailored to your individual desires to create a unique engagement ring or jewellery piece. The custom design process is a journey of the senses where you can see and touch your design before it comes to life, ensuring the finished product is better than you imagined. How Do I Narrow Down the Design? 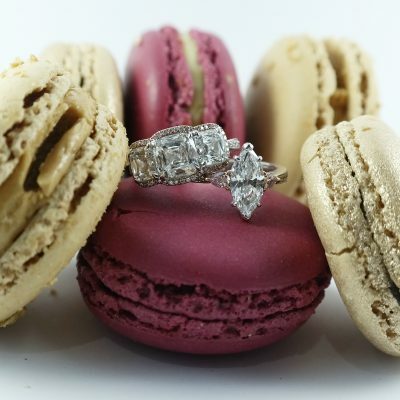 Please feel free to browse our inspired jewellery collection, including exquisite engagement rings and matching wedding rings to get an idea of what you like. Consider whether you would like yellow gold, white gold or Titanium, the size and shape of the diamond and the design of the band. Charles Edward Jewellers specialise in engagement rings and wedding sets, and can help you narrow down the design with a few simple questions. Would you like to get an idea of who you could work with in designing your dream ring at Charles Edward? Our specialists are passionate about jewellery and ensuring you receive an exquisite piece to last for generations. Please feel free to contact us today on 08 9327 3188 to discuss your queries or to book an appointment or simply pop in and visit our store.